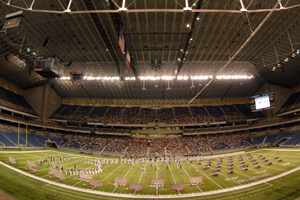 The 2011 Drum Corps International Tour will return to the San Antonio Alamodome this summer, as World Class corps travel deep into the heart of Texas for the event on Saturday, July 23. Ranging in price from $30 to $55, tickets for the DCI Southwestern Championship are now on sale through Ticketmaster online (Ticketmaster.com) and by phone (800.745.3000). View additional event information. Order through Ticketmaster. Read more about the DCI Southwestern Championship. A discounted $20 ticket rate is available to groups of 20 or more. Group tickets are only available through the DCI Box Office by phone at 317.275.1212. Visit DCI.org/groups for more.